Accepting and valuing people and groups who are different from oneself and one's immediate family is a critical social skill. This book introduces diversity and related concepts: respecting differences, being inclusive, and appreciating people just the way they are. Includes questions, activities, and games that reinforce the ideas being taught. Without scaring kids (or alarming adults), this book teaches little ones how to avoid potentially dangerous situations, ask for help, follow directions, use things carefully, and plan ahead. Includes questions, activities, and safety games that reinforce the ideas being taught. Full color. It's never too soon to learn the difference between what's true and what isn't. Words and pictures help young children discover that being honest in words and actions builds trust and self-confidence. They also learn that telling the truth sometimes takes courage and tact. Includes discussion questions, skits, scenarios, and games that reinforce the ideas being taught. Demonstrates ways of showing politeness, speaking kindly, using basic courtesies, and respecting the feelings of others. Everyone gets angry, so it's never too early for children to learn to recognize feelings of anger, express them, and build skills for coping with anger in helpful, appropriate ways. Children learn that it is okay to feel angry--but not okay to hurt anyone with actions or words. They discover concrete skills for working through anger: self-calming, thinking, getting help from a trusted person, talking and listening, apologizing, being patient, and viewing others positively. Reassuring and supportive, the book helps preschool and primary-age children see that when they cool down and work through anger, they can feel peaceful again. Eli knows the difference between pretending and the real facts. Pretending is what he does when he orbits the earth, and the real facts are what actually happen. Sometimes in REAL life, keeping to the facts is hard for Eli. With the help of his parents and the super-deluxe Lie-O-Meter 2.0, Eli learns about the consequences of his fibs and the value of telling the truth. Perfect for teachers this accessible book shows how to introduce positive values into your classroom, be a positive role model to all members of the school community, explain this values approach to others, and maintain a positive outlook in your demanding role. With a lot of questions our hero is off and running. This is all about relishing the journey and making good choices along the way - because how we live and how we love is how we learn to make the world a better place, one small step at a time. In simple words and real-life illustrations, this book teaches the basics of cooperation, getting along, making friends, and being a friend. Useful as a social story. A child who can�t follow rules is a child who�s always in trouble. This book starts with simple reasons why we have rules: to help us stay safe, learn, be fair, and get along. Then it presents just four basic rules: �Listen,� �Best Work,� �Hands and Body to Myself,� and �Please and Thank You.� The focus throughout is on the positive sense of pride that comes with learning to follow rules. Includes questions and activities adults can use to reinforce the ideas and skills being taught. This book introduces and explains what listening means, why it's important, and how to listen well. The focus throughout is on the positive results of being a good listener. These are often used as 'social stories'. This book begins with the concept of gratitude, because feeling grateful is a powerful motivator. Words and pictures show children contributing to their community in simple yet meaningful ways. Includes discussion questions, a philanthropy role-play, generosity games, and ideas for service projects. Everything has a place. Things last longer when we take care of them. Respect, responsibility, and stewardship are concepts that even young children can relate to�because they have things they value. This book encourages children to pick up after themselves, put things back where they belong, and ask permission to use things that don�t belong to them. It also teaches simple environmental awareness: respecting and taking care of the earth. Includes ideas for adult-led activities and discussions. Sharing is a social skill all children need to learn�the sooner the better. Realistic examples and clear illustrations help children practice sharing, understand how and why to share, and realize the benefits of sharing. Includes a note to teachers and parents, additional information for adults, and activities. Addressing racial discrimination, this title encourages kids to accept and be comfortable with differences of skin color and other racial characteristics among their friends and in themselves. Questions, at intervals, facilitate conversations about the topic. What�s the best way to solve problems between people? By talking them over and working them out. It�s never too soon for children to learn the process of peaceful conflict resolution. This book distills it into clear, simple language and supporting illustrations. Children learn to calm themselves, state the problem, listen, think of solutions, try one, evaluate results, and even agree to disagree when a solution isn�t possible. Includes skill-building games and role plays for adults to use with children. It�s hard to stick with it when something is more difficult than we thought, or doesn�t work out the way we planned. This book teaches children about flexibility and perseverance. Empathy is key to positive, healthy relationships. This book builds empathy in children. In clear, child-friendly words and illustrations, it helps them to understand that other people have feelings like theirs�and different from theirs. It guides children to show they care by listening to others and respecting their feelings. This book tells a story that weaves its way around the Earth across cultures and generations celebrating the bonds that unite us all. 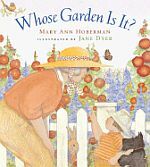 When Mrs. McGee walks through a garden wondering whose it is, all of the plants and animals as well as the sun and the gardener claim it as their own.